I really don’t know what we would do if Oshtemo Township didn’t have a leaf drop off day every fall. In the past, J and I have bagged upwards of 90 bags of leaves from our backyard. For whatever reason, this year, we only did about 45. Still, I had 45 bags of leaves to get rid of. Yesterday was the drop off day at the Oshtemo Township Park. It took me three trips in my truck to get all the bags there and afterwards, I offered to go pick up lunch. Through our jobs, J and I both saw copies of the Western Michigan University Directory which has a plethora of coupons in the back. Since I work in Grand Rapids, no one else was really interested in any of the coupons, so I went through and clipped out what I thought we would use. The one I’ve been the most excited about using was for a new BBQ joint on the east side of town. 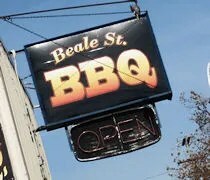 Beale Street BBQ is on Riverview Drive just south of Gull Road. The building has housed many things since J and I have been in town. Most recently, I think, it went by the name The Shack. I tried several times to stop and check that place out, but I could never figure out when it was open. The hours were so sporadic and the business closed before I could get a chance to actually find it open. Not too long ago, new signs popped up on the side of the building, but I never could tell if the place was actually open. It seems like I always drive in that area late at night, so I’ve never actually seen it open. Once I saw the coupon, I assumed they were open and really had no reason not to believe they would be open on a Saturday afternoon. As I was driving down Riverview Drive, I noticed big flags out front that aren’t there normally. They settled the dilemma as to whether they were open or not. The small parking lot on the side of the building leads to a wooden porch which serves as the entry door. There is a door right off of Riverview, but that door appears to be closed off as it would open up right in to the small dining room. The small restaurant is divided in to two sections. The first place you come to is the order area/kitchen. 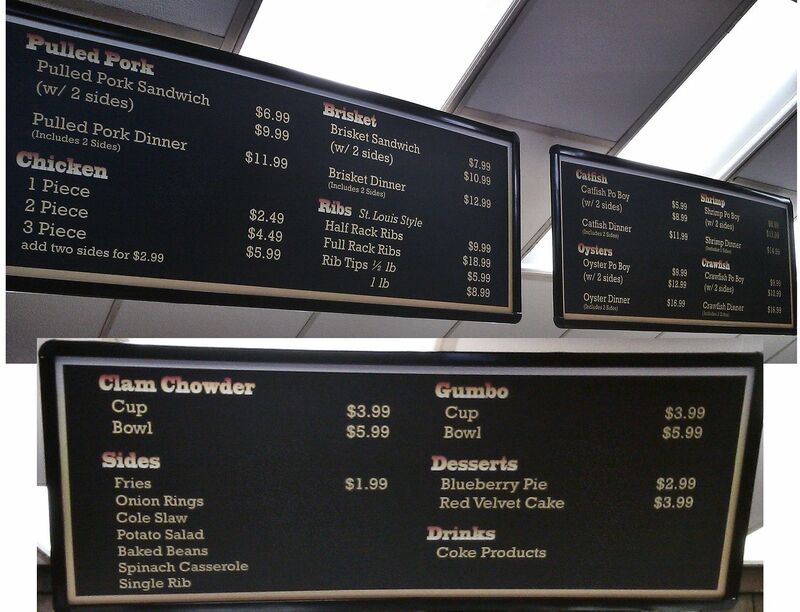 The small BBQ menu hangs above the cash register. My coupon was for a free pulled pork sandwich with the purchase of the pulled pork meal. That worked out perfect for us. J and I both like pulled pork and I don’t mind ordering the meal every now and then instead of the sandwich. J prefers sandwiches, so I let her have that. The meal comes with choice of two sides. I chose the fries and baked beans then I added on another order of fries for J. In hindsight, we could have just shared, but whenever I have that feeling, I’m usually wrong and we both end up wanting a lot of fries. The total for the meal and extra side was just over $14, but I saved about $6 on the sandwich. It took less than ten minutes for the food to be boxed up for me. Before I was handed the bag, I was asked if I wanted any extra sauce. 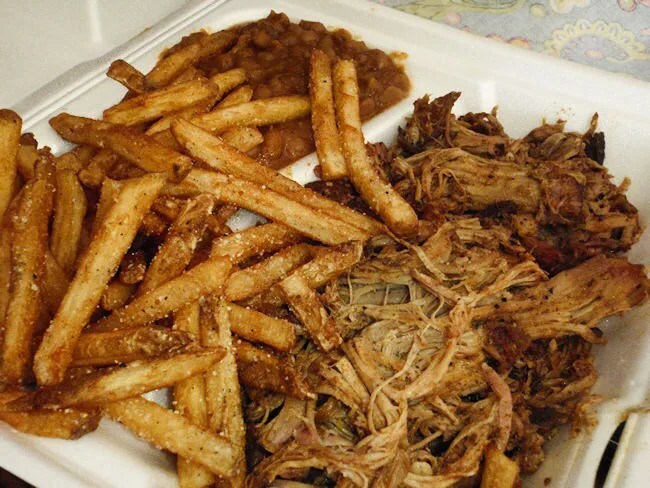 The three choices are the traditional, Carolina sweet, and hot BBQ. I asked for a little bit of the hot and just a small sample of the Carolina sweet. I should have just went for the trifecta and asked for the traditional as well just to taste it. When I got home with the food, we got L set up in her high chair and popped up on the boxes. First thing I noticed was how much food was included in my meal. There was a large pile of tender, juicy pulled pork that had a sweet, smokey flavor with just a light drizzling of sauce. After a few bites, I poured on some of the hot BBQ sauce which kicked the flavor, and heat, up just a bit. The hot BBQ sauce has a great sweet and spicy flavor to it. 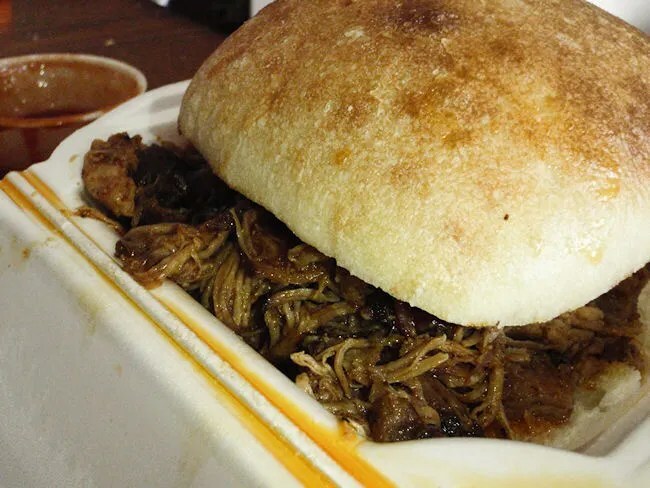 J’s sandwich was the same smokey pulled pork that I had, but it is served on a ciabatta bun. She said the bread really added a lot to the sandwich. She’s a fan of really sweet BBQ sauces and we were missing that. The meat itself comes with a pretty thin vinegar sauce. I think if she would have had a really sweet, thick sauce, she would have really liked the sandwich. As it was, she said it was still really good. The fries could have been fantastic, but they were too salty. They were fresh cut, skin on fries that were fried to a delicious golden brown, but they were so salty that we didn’t eat a whole lot of them. Dial that back a little and they would be really tasty. I’m not really a fan of baked beans, but I knew J is which is why I got them with my meal. I didn’t even try them, but J said they were delicious. They had a little bits of jalapeno in them which, again, gave them that sweet and spicy flavor. 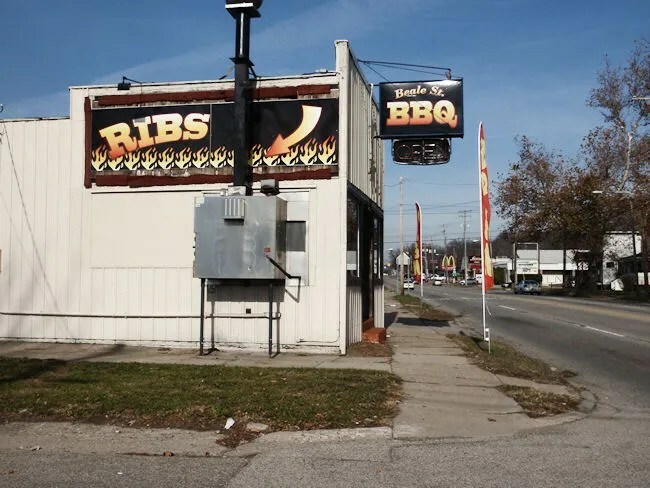 It’s always nice to have more true BBQ options. Beale St. BBQ almost hit a home run, but the over salted fries are what really sticks out to me unfortunately. J and I both liked the pulled pork which I thought was perfectly cooked as it was really tender, juicy, and had a great smokey flavor to it. I’ll have to give it another chance just because I did really like the meat. Dial back the salt on the fries and we’d have a pretty good meal. ← What To Do For Thanksgiving….